Hi! I’m Christina (one of the MD/DE state reps) and I blog over at Mom’s Messy Miracles. We love party food. I mean, who doesn’t really? With the baby, we have a ton of the little glass baby food jars left over that I’ve been saving for craft projects. Did you know they also make perfect party portions? 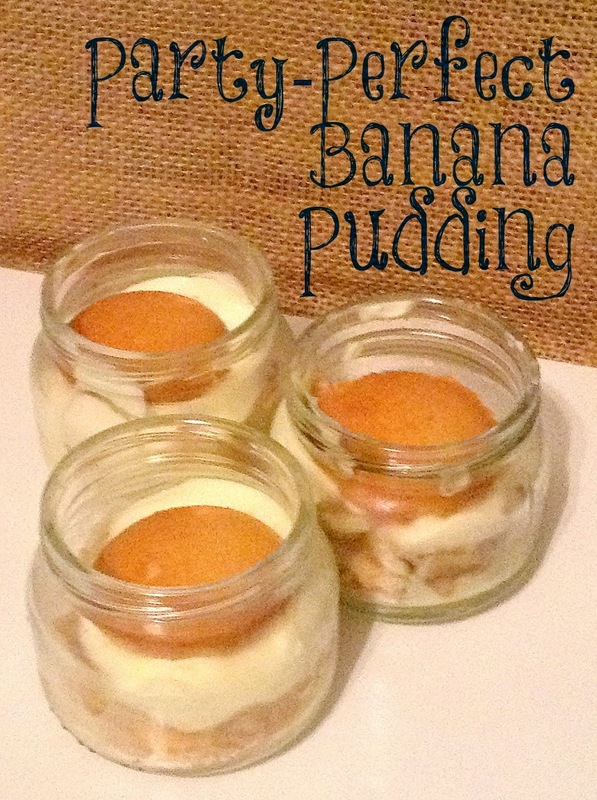 We made this yummy banana pudding this weekend that is perfect for any party! Mix vanilla pudding and milk. Let set according in fridge for at least 5 minutes. Fold in frozen whipped topping. Place one spoonful of pudding into jar. Put a thin layer of crushed cookies into jar. Put a layer of 3 banana wheels into jar. Add another spoonful of pudding into jar. Put 1 whole vanilla wafer cookie on the top. Enjoy your awesome party food that looks super cute!